AFTER LOSING SEVEN OF THEIR LAST TEN, CAN SCOTT ROLEN'S REDS BEAT THE COLD? Aaron Harang did everything he could to help the Reds avoid a sweep by the Seattle Mariners on Sunday. Harang went six innings for the Reds allowing only one run on three hits. Aside from Harang's start against Houston on May 29 (7IP, 1ER, 4H) when his team supported him with twelve runs, it was his best game of the season. Harang received the loss as his team's offense remained cramped in Seattle. On Sunday, the Reds lost 1-0 to the Mariners for the second time in three days. Only one run was scored by the Reds during their three day stay in Seattle. On Friday against the Mariners, Johnny Cueto also pitched well enough to receive the victory. Cueto pitched only 5.2 innings, but allowed just one run on four hits. Once again, the Reds' offense failed to score as Cliff Lee pitched a complete-game shutout (6H, 7K) to defeat the Reds 1-0. Sam LeCure started for the Reds on Saturday. Outside of one ugly pitch that propelled a four-run sixth, LeCure pitched dutiful. Scoring their only run of the series in the fourth inning, the Reds' offense failed to supply Lecure with an anchor. Felix Hernandez hurled a complete-game (5H, 9K) as the Mariners beat the Reds 5-1. During their three game series with the Mariners, the Reds stuck out 23 times and collected only 14 hits. Joey Votto and Scott Rolen combined for half of the Reds' hits against the Mariners as Brandon Phillips, Jonny Gomes, Jay Bruce, and Orlando Cabrera only had one hit a piece the entire series. There is no bright side of being swept by the worst team in the AL West and falling 1.5 games behind the St. Louis Cardinals, but the performance of the Reds' pitching staff over the weekend was nothing short of concrete. The Reds' bullpen set aside their recent struggles and combined for 8.1 scoreless innings of relief allowing only three hits. A Reds' offense that currently leads the NL in runs (337), hits (650), homeruns (83), RBI (327), slugging percentage (.449), and average (.276) should have capitalized, but didn't. The Reds' pistons have trouble when it comes to collective firing. "It was a tough series to swallow," said Aaron Harang. "We have to look forward to going down to Oakland and turning things around." The Reds have lost six of their last seven games inspiring some of their followers to remember Junes of the past. 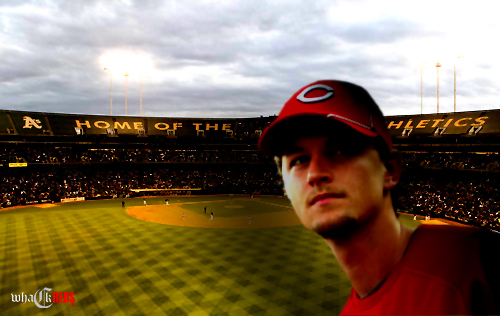 The next three games in Oakland will be a true test for the Cincinnati Reds. They have played hot, and stayed hot, many times this season. It is the reason they are five games above .500 and only 1.5 games out of first place. Teams will always go cold during a tedious 162-game season, but only the good teams rise to the occasion and stop the bleeding. The leadership and determination of Scott Rolen, Joey Votto, and Brandon Phillips will be closely monitored as they attempt to overcome. Go Reds!